I am now highly satisfied with the PDF export of inkscape, as it seems to use all the possibilities of PDF standard including transparencies. I am using Okular myself to view PDFs, and most of the transparencies I use (transparent fill or gradient) are rendered appropriately. But now, the problem lies with the ordinary man's PDF viewer : many (windows or mac users) view a highly damaged PDF. E.g., a transparent-to-opaque gradient is rendered as fully opaque, but also plain partly-transparent fills are rendered in a seemingly random way. I am wondering whether it would be possible to script inkscape to actually convert a transparent object into a set of objects having the solid-colour of the rendering ? E.g., if a semi-transparent yellow circle partly covers a blue square, that the script makes 3 objects out of these two : square minus circle (Ctrl+-) in blue, circle minus square in (light) yellow, and circle and square intersection (Ctrl-*) in the green shade that result in the transparent yellow over the green ? This could even work for transparent gradients over solid colour shapes (although not for gradient over gradient). c) create a new layer "Bitmap" next to the layer "Transparent", import the PNG you've just saved. d) In the doc properties, note the size of the page, and then scale the bitmap (Object>Transform) to match this size exactly. e) Ctrl-Shift-A and align object vertically and horizontally with page. f) Turn off the viewing of layer "Transparent" and turn on the layer "Bitmap" before exporting your PDF. This way, you have a combined Bitmap+Scalable Vector document : only the tranparent fill is not scalable, but it will be rendered correctly in PDF viewers. a) You need to repeat this operation each time you modify any of your transparent objects. b) You also need to repeat this if you have transparent objects at different depths. c) There may be PDF viewers not even handling bitmap tranparency, in which case vector elements in layers below the "Bitmap" layer may not be rendered properly. 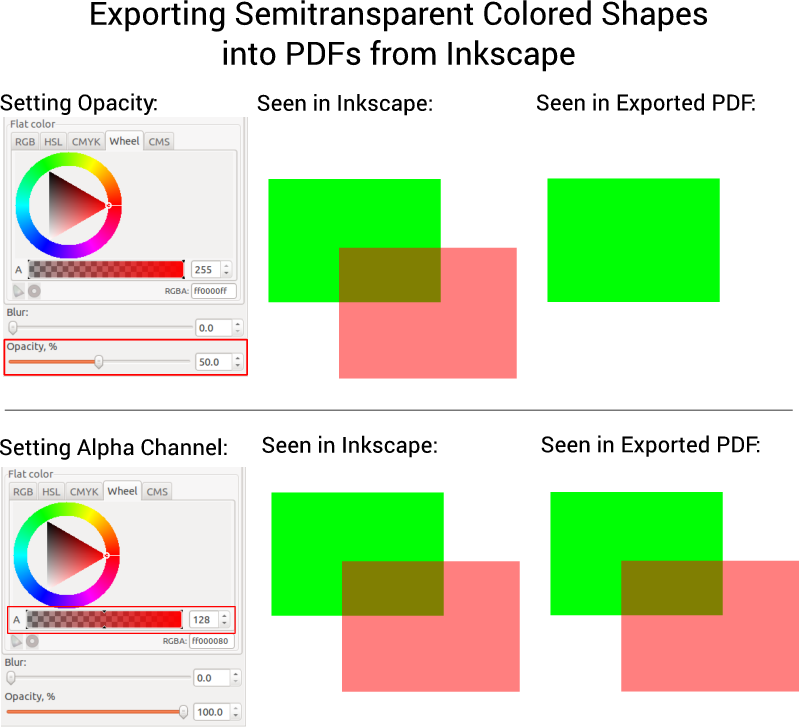 So you're trying to export an SVG that includes (semi-)transparent, colored shapes into a PDF - and they are missing from the final PDF file. Instead of setting the Opacity, set the Alpha value of the color of your shapes. in the new file. Well, it may need some tweaking for your files, but it should not be too hard to do so. One caveat is that you may need to ungroup all your objects before running this since "style" format for grouped objects may be different.